One of the great things about retirement is the freedom to take advantage of good weather and make a wildlife watching trip on the spur of the moment. Yesterday was one of those days and I spent it in my favorite area in NC – Pocosin Lakes National Wildlife Refuge. I arrived about 8 a.m. and was going to scout the area for bears. 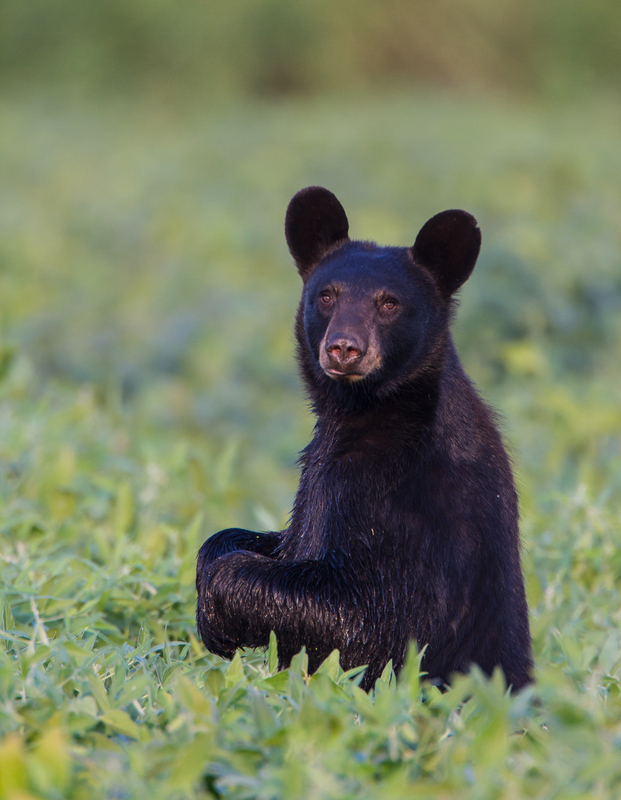 The rains this season (and perhaps some Federal budget cuts) have made for tall vegetation along many of the roadsides so it is a little tough to see while driving in certain areas but I soon found one bruin waddling along a dirt road. It wandered off as I approached and I could hear it walking through the swamp when I stopped and got out. I continued over to one of my favorite spots and was surprised to see two other vehicles at the gate. Turns out one was a couple of friends who were down the road looking for bears and the other was a man that knows an old friend of mine from graduate school – small world. The last thing I thought I would be doing at Pungo yesterday was socializing! After spending about an hour chatting I decided to explore some other areas of the refuge and headed out. 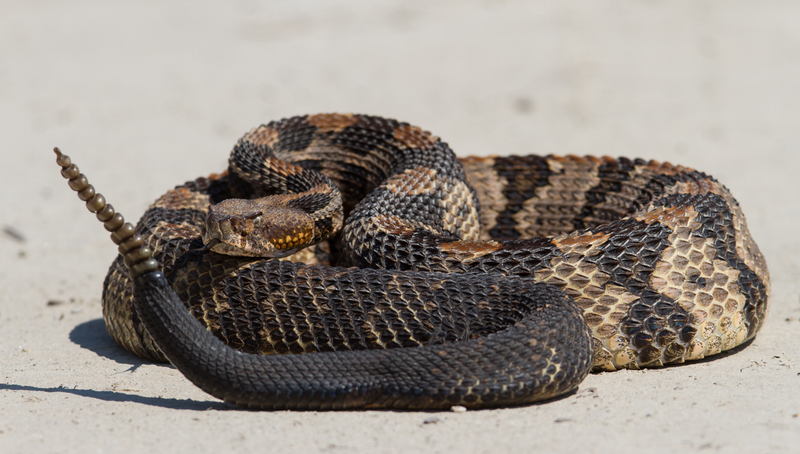 I soon found a large Timber Rattlesnake crossing a sandy stretch of road. 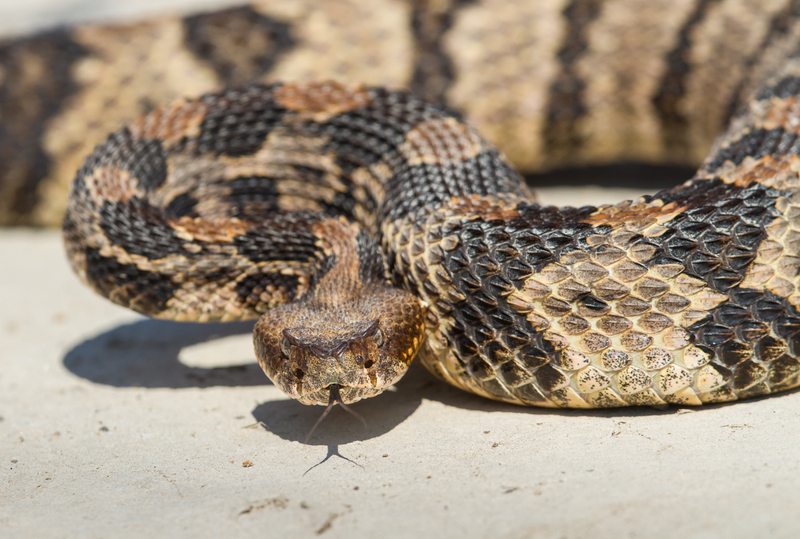 Timber Rattlesnakes in this part of the state are usually lighter colored than those in the mountains and are often referred to as Canebrake Rattlesnakes. The name refers to the large patches of River Cane, a type of vegetation common in the coastal plain, and an excellent habitat for these snakes. This area has a healthy population of these beautiful snakes so I got out and watched it for a few minutes before it finally crossed the road and disappeared. Unfortunately, I later found one in another section of the refuge that had been recently killed by a vehicle. 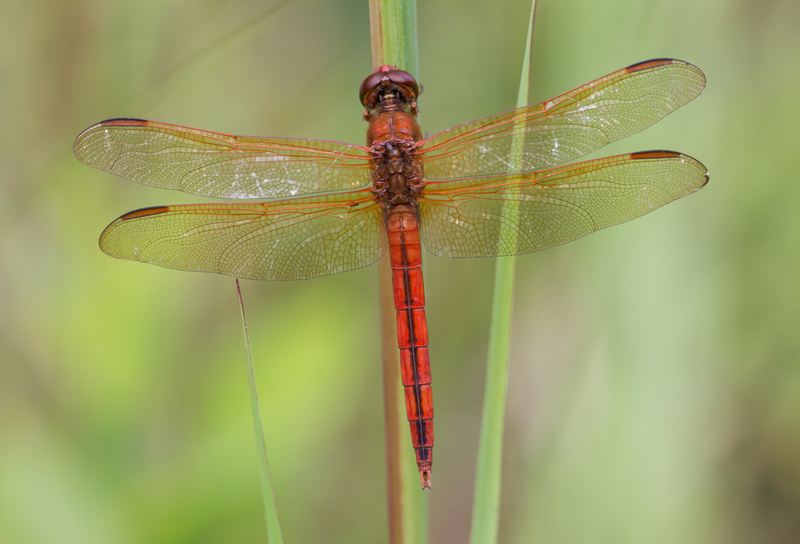 I drove over to Alligator River National Wildlife Refuge to look around, and, while I did see two bears in a soybean field, it was the abundance of invertebrates that caught my eye. Dragonflies and butterflies were out in large numbers. 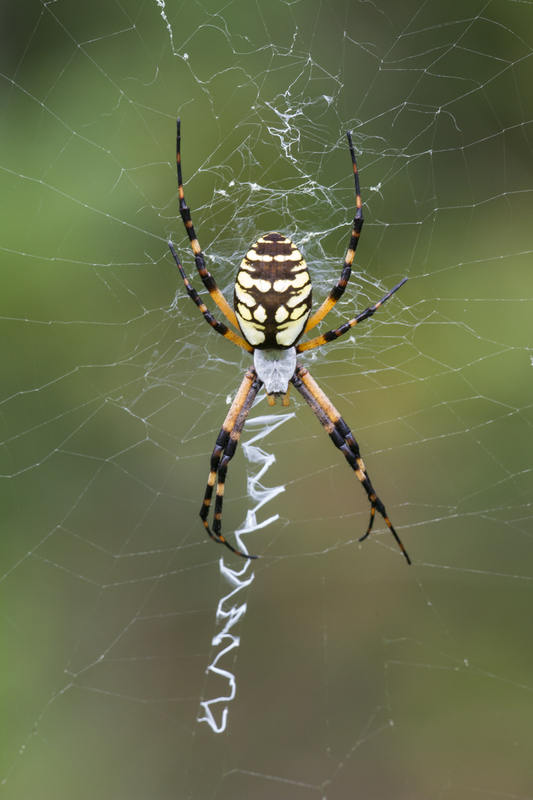 I also spotted several large Argiope spiders as I drove slowly along the refuge roads. Late in the afternoon I decided to drive back through a section of the Pocosin Lakes refuge that I had never explored. I ended up driving all the way through the refuge from Hwy 94 to the Pungo Unit on miles of well-maintained gravel roads Along the way I saw three Black Racer snakes, a few Wild Turkey, two bears, some deer, and more Northern Bobwhite Quail than I have seen in several years. Palamedes Swallowtails were flying everywhere along the route. 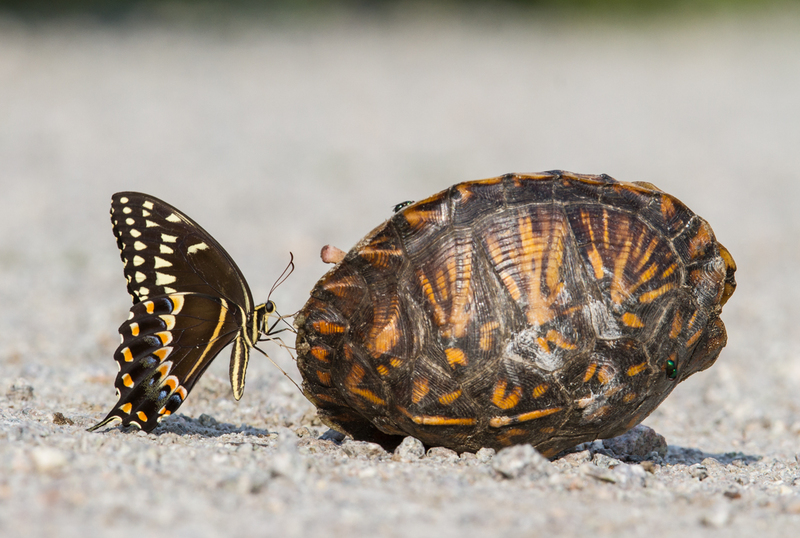 These are the quintessential swamp swallowtails and large numbers were puddling in moist spots along the gravel roadways. There was also one sipping a macabre meal form a dead Eastern Box Turtle, one of two box turtles I found dead in the road on the refuge. Both turtles were laying upside down and did not seem to be damaged by cars so I am not sure what happened to them. It was getting late in the day by the time I arrived back at the Pungo Unit of the refuge. Out of the corner of my eye I saw a bear standing, looking over the vegetation. 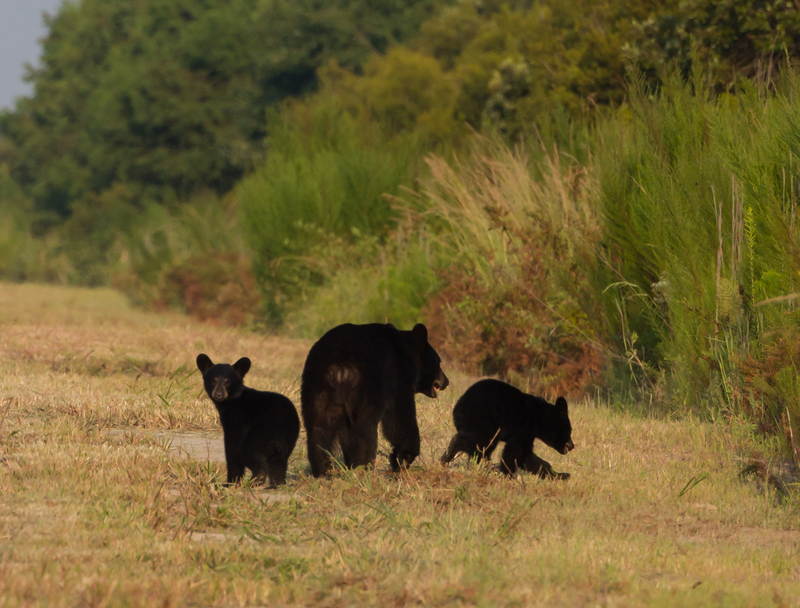 By the time I stopped the car and grabbed the camera, she had dropped down and was ushering her two young cubs in the opposite direction. Too bad I had missed that shot of her standing looking at me with the cubs huddled by her side. I ended up seeing eleven bears for the day but the last one was my favorite. 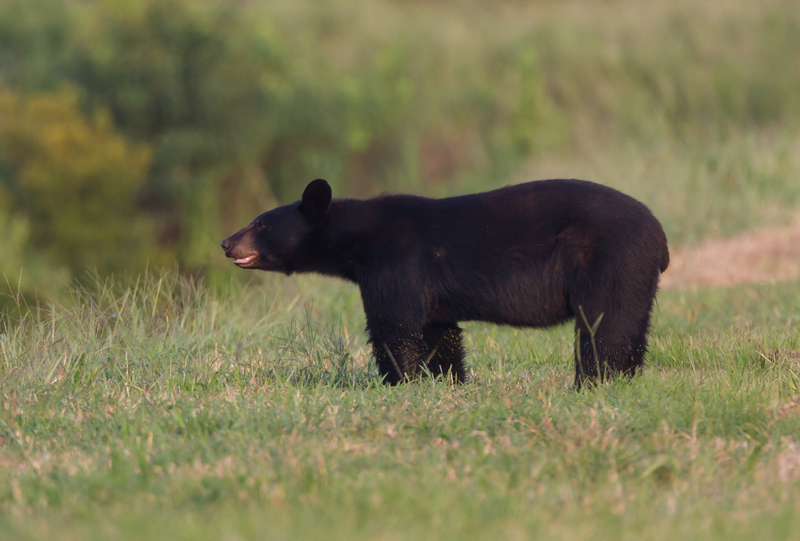 The bears are now feeding in the corn fields on the refuge so I went to one where the fading sun was at a good angle and started walking down a path. As if on cue, a bear walked up out of a canal and ambled down the path ahead of me. It sniffed, walked, sniffed some more, and then went back down into the canal and into an adjacent soybean field. All I could see were the round black ears moving through the tall soybeans. The sunlight was almost gone so I took a few more steps and apparently made a little too much noise, which caused the bear to stand up, providing me with the shot of the day. The bear looked around and must have decided all was well, as it dropped down and continued walking off to find a nice spot to dine in peace. You never know what you are going to see on these refuges, but there is almost always something memorable.